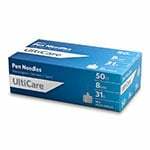 UltiCare Mini Pen Needles (31g, 0.25 inch, 100ct) pen needles are non-pyrogenic and non-toxic. They may be used as replacement needles for all Type A pen delivery devices including: Autopen, BD pen, FlexPen, Humalog Pen, Humulin Pen, InDuo, InnoLet, Innovo, NovoPen Junior, and NovoPen 3ml. 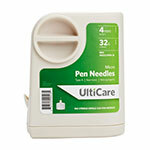 UltiGuard UltiCare Ulti-Fine IV Mini Pen Needles is a complete solution for the dispense/disposal of your needles. The UltiGuard conatiner stores the pen needles convenience and immediate delivery. 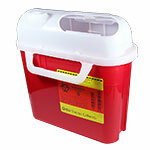 To dispose of a needle, just place it on the top of the container and give it an easy turn. The needle will be safely discarded inside of the container, greatly reducing the risk of accidental needle sticks. The UltiCare container is tamper proof. Ulti-Fine IV UltiCare Mini Pen Needles. We live in a rural area and finding these Pen Needles is difficlut IF they are in stock. I ordered 2 of the ones my wife uses for about $10 less each and they arrived at my door. No more wrong guage, too short...more costly pen needles for us. THANKS A.D.W.